I think I mentioned a few days ago that I was in the process of trying to find something to put over our bed. I’d looked at a few fabric stores but I couldn’t find anything I really liked. Today during lunch I decided to run to Michael’s. I figured if nothing else I could go ahead and find some frames. Boy was I in luck because all their frames were 40-50% off. SCORE! 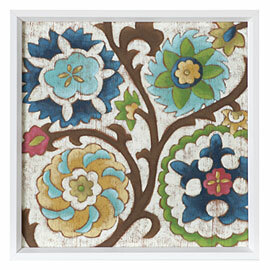 I managed to find 4 frames I really liked and with the discount they would be about $15.00 each and I needed 4. Above is my inspiration pic but at $88.00 each buying 4 would have been silly. Obviously this pic is pretty awesome but I just couldn’t justify that kind of price. I knew I should be able to do something similar for a lot less. I just needed to find it. While I was at Michael’s I started browsing the scrapbook section. They have TONS of paper and I figured there had to be something I thought might work. After looking for a while I finally came across a book of paper. Out of the 180 sheets I found a few pieces I thought would work. There was only one real problem, they only had 3 of each page. GRRR! This would mean one of two things, either I used 2 different prints or I would have to use 4 different prints. I wasn’t sure how I would feel about either of these options. On top of that the book itself was $12.00. Not a bad price really for all that paper but I don’t scrapbook so I would probably have a book of paper sitting around for a while. I decided to check out the individual pieces of paper. A few minutes of looking and I found something I really liked. It had all the right colors and for a $0.50 a piece I was sold. 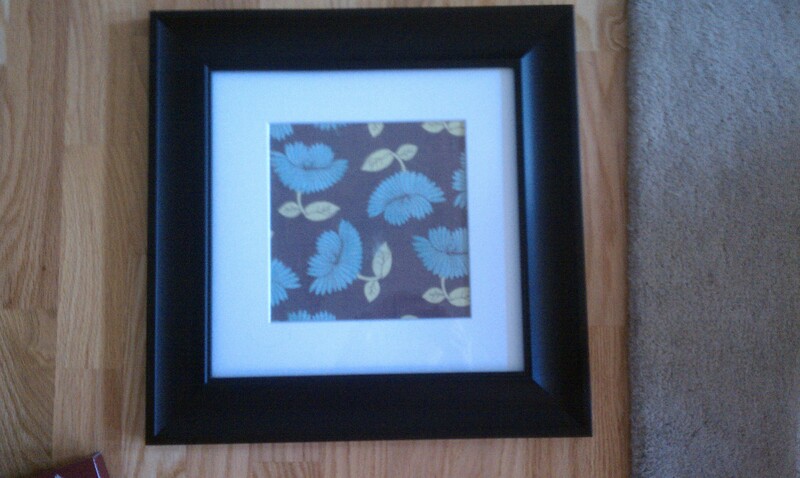 I’m pretty proud of my DIY artwork and for $66.00 and change it is a great deal. Sorry for the craptastic pic. It was a quick cell pic. As you can see I was trying to decide between matted and plain. In the end Matt’s choice of matted won out. I think once we get the walls painted they will really pop. 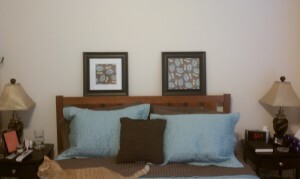 I will post more pics once we get them hung this weekend.